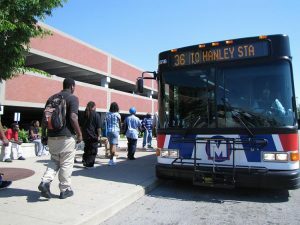 Thanks to ARRA, Metro has just started working on improvements to the North Hanley MetroLink Station. 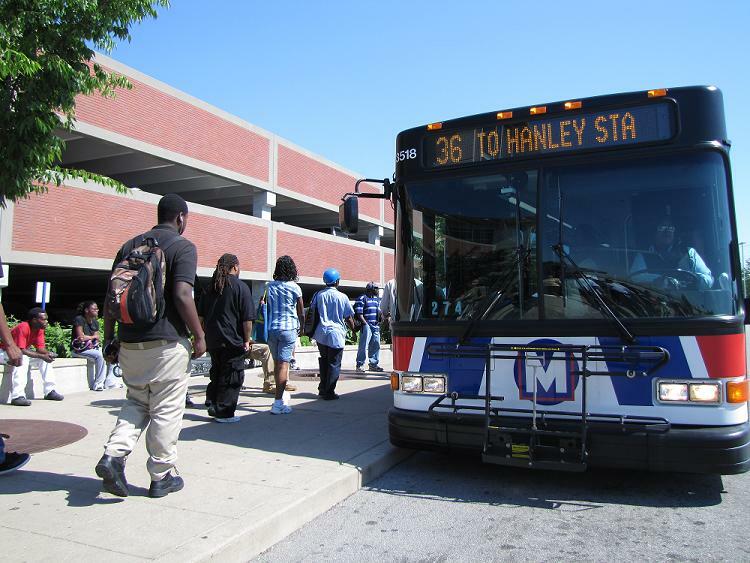 Nothing fancy, but these improvements will help the station accommodate higher frequencies of bus service, improve traffic flow, segregate bus traffic from customer vehicles, and provide a smoother ride for customers. Of course, all time schedules are based on cooperative weather! Repairing sidewalks, replacing curbs, storm sewer work, striping and other miscellaneous work. 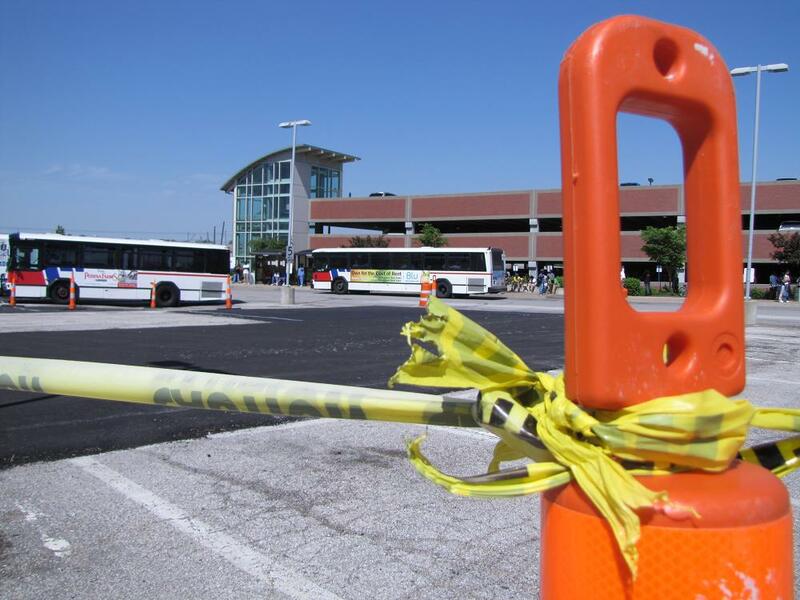 Due to the bus road construction, riders are currently catching the bus at temporary stops. When the bus road is completed mid-May, the temporary stops go away and you will be back in the bus berths. These temporary stops mean that there are fewer parking spaces available in the lot due to the construction. Also, some of the disabled access spots had to be removed, so we’ve added more of them in the parking garage to accommodate our patrons. Those spots will come back (and the temporary ones added in the parking garage will go away) when the bus road construction is complete and the temporary bus stops are gone. Beginning mid-May, the parking lot will be resurfaced in four (4) phases. This is being done so that no more than 20% of the parking area is impacted at any one time. You will still be able to park at North Hanley during this resurfacing project! Our Project Manager tells me this lot isn’t reaching capacity except on baseball game days, so regular commuters should have no trouble finding a parking spot even during construction. The contractor has until the end of November to complete this project. 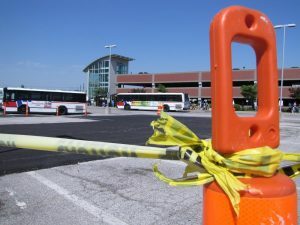 We’re phasing it out over a longer period of time to ensure that the parking lot and bus loop remain as useable as possible and the work only minimally impacts our customers. Bike racks would be a GREAT idea and are relatively inexpensive. Thanks for comments on bike racks. I’ll see what we can do to get racks out there. Thanks for the updates Courtney. It would be great to see what the “standards” are for each Metro station. Could something like bike racks become standard like benches or lighting are? They seem essential for many Metro riders. When I saw the construction on the Cross County line, I noticed some of the guys were smoking on the job. For the safety of passengers in areas where construction is going on, and for the commuinities that is surrounding the area, we should ban the construction guys from smoking because you never know what is in those chemicals and if a hot cigarette ash hits one, it could set off an explosion and we would be in big trouble with the neighbors. I was also wondering about restroom facilities for passengers, and if there are plans to include them in this update. There is demand. I was there @ the Hanley Station today …even on a rainy day and saw two bicycles locked to a tree! We do not have public restrooms facilities at our North Hanley MetroLink Station.